If your order weighs less than 13 ounces, save huge on shipping with USPS first class (with tracking number). This product weighs 1.3 oz. Nature’s Sunshine HY-C TCM Concentrate blends 16 herbs traditionally used in China to maintain normal metabolic processes. The same formula as HY-C TCM but in a highly concentrated form, this herbal combination is known as bu yin or “supplement yin” in Chinese. HY-C TCM strengthens the water element in the body while reducing fire, qualities that are associated with organ health and healthy metabolic processes. Instructions: Take one or two capsules with a meal daily. 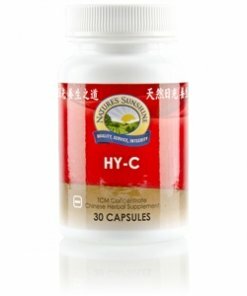 Each capsule is equivalent to 5 capsules of regular Chinese HY-C combination. TCM denotes Traditional Chinese Medicine. Magnesium stearate (vegetable), silicon dioxide (powdered silica), gelatin, and water.